Long before Ophelia begged Laertes, “There’s rosemary, that’s for remembrance. Pray you, love, remember,” mourners would throw rosemary into graves as a symbol of remembrance. To me, lilacs are for remembrance. I grew up in a large family with a scraggly yard. Except for occasionally mowing the lawn, no one bothered much with keeping the yard nice, though when I was in second grade, I was allowed to grow a small garden. (“Grow” is a misnomer. I planted sweet Williams, and one or two flowers even came up despite my massive neglect.) Surprisingly, a lilac bush thrived in a corner of that unkempt yard. Though no one ever took care of it, never even watered it, it managed to bring forth gorgeous and gorgeous-smelling blossoms every spring. Truly a miraculous plant. Many years later, my now deceased life mate and I transplanted an unruly lilac bush that blocked a gate. We ended up with dozens of plants, enough to surround the whole property. Apparently there were plenty of live roots left because eventually the original bush grew to be as large as it was before we’d massacred it. Western Colorado is often visited by late frosts, so we didn’t always have lilac blossoms, but the spring before he died, the entire place was wreathed by luscious blooms, a luxury he once could only dream of. A year after he died, I was Blindsided by Lilacs. I’d come to a desert community to look after my aged father. The vegetation was completely different from anything I was familiar with, so there were no scent memories. Then one April day, when I was walking down the street, the smell of lilacs wafted toward me from an empty lot. Instantly, I was back in full grief mode, unable to stop crying for days. Today, I felt sad and needed to feel close to him, so when I passed that still empty lot, I went to inhale the blossoms and think of him. I’d never put flowers by his photo, not wanting it to seem like a shrine, but today I picked a sprig of lilac and brought it back for him. Sitting here now, I can smell that lovely fragrance, and I remember. Rosemary is my favorite herb. But lilacs are fine, too. We have both in our yard and both are growing without restraint. Rosemary tastes like soap to me. So does cilantro. I wonder if, like cilantro, rosemary needs a specific enzyme to digest away the soap flavor. I got it at the grocery store, For all I know, it could have been anything. Rosemary makes a lovely part of a wild garden, and it flowers very beautifully–and pollinator attractively, too, as does sage, which is on it’s way to taking over whatever plot it is in. But Lilacs are something special–and headily connected to my past, as well. What a lovely post! 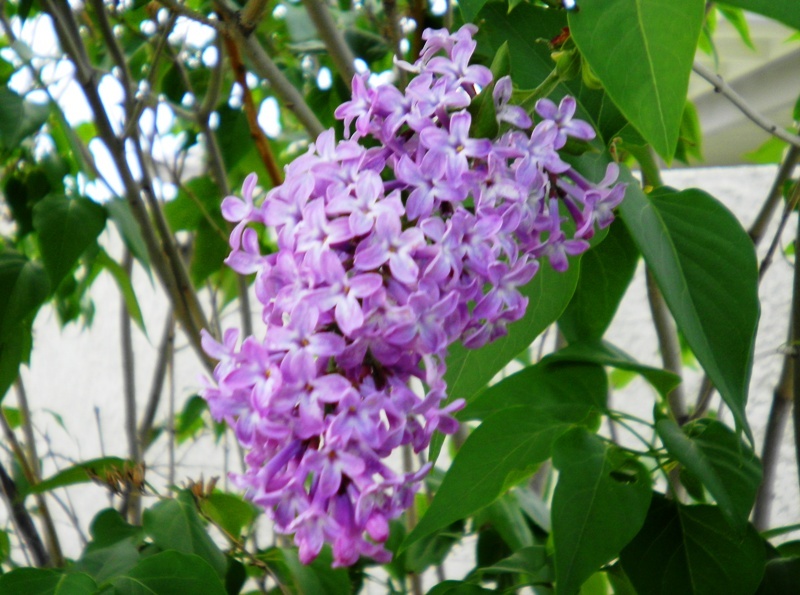 I have tried bringing beautiful lilacs into the house, but the fragrance is a bit too powerful for me. It is fascinating how scents can evoke memories in us, even recalling childhood settings. A few years ago I discovered that Willa Cather wrote of placing bay leaves in dresser drawers, so I gave that a try and loved the scent that permeated the clothing. Before reading about it, I only used them in pot roasts. I always packed sweaters away with bay leaves. Bay protects them from moths.